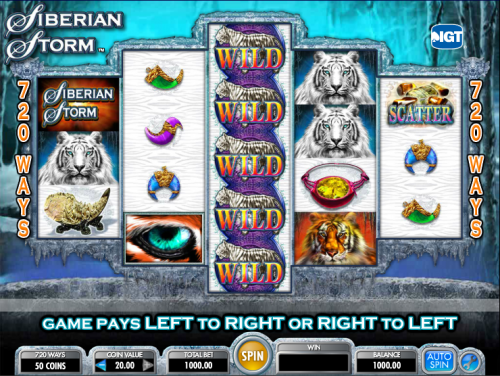 IGT’s range of online slots rarely fail to impress and Siberian Storm is a great example of a slot with some innovative features. The game uses IGT‘s Multiway Xtra feature (of which more later) but which essentially means that the game pays from left to right and right to left and there are 720 possible ways to win. The game is set against the background of a chilly Siberian forest and there a range of symbols involved in the gameplay, some Siberian-themed and some from the realms of fantasy. There are five reels but as you can see from the screenshot above the playing area looks a little different. The five lower value symbols are various well-drawn relics but further up the scale are a white tiger and an orange tiger as well as a Siberian Storm logo. The wild symbol is a white striped tiger on a purple background, there’s a scatter symbol labelled ‘scatter’ and the green eye of the orange striped tiger is the bonus symbol. 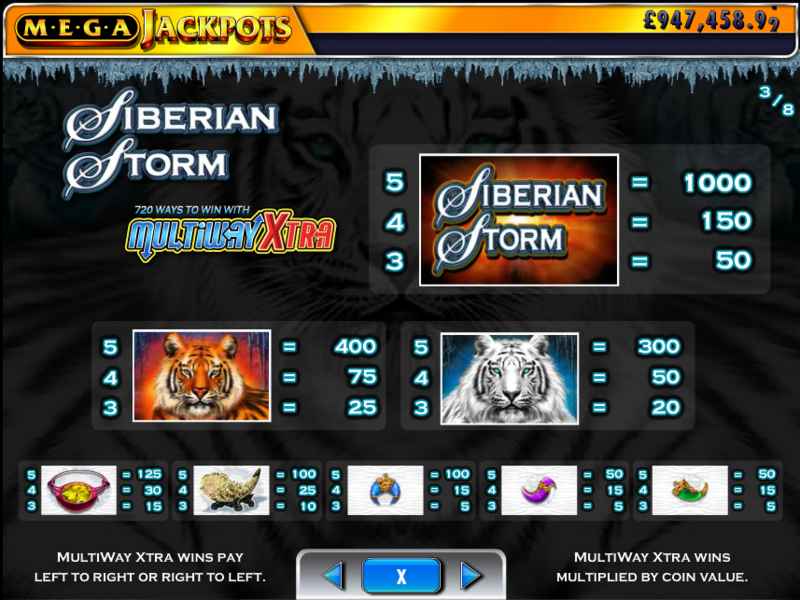 **Update** Siberian Storm has been updated to include the MegaJackpots progressive jackpot. This feature is active throughout the game and means that wins pay from right to left and left to right; as long as the symbols are in adjacent reels there’s a win for the player but additionally if the symbols are in the same column a multiplier is awarded. This bonus can be a little tough to land but it’s worthwhile if you can; you will need to land five of the green eye symbols on five consecutive reels and you’ll win 8 free spins. If you can land more than one winning selection of green eyes you will win another set of free spins. In this manner it is possible to win up to 96 free spins with win spin of the reels. If that’s not enough then landing the orange eye symbol (which only appears during the bonus game) will win you another 8 free spins. During the bonus game the most free spins you can win is an impressive 240. If you are playing the progressive version of Cleopatra then the way to win the big bucks is to land five of the Mega Jackpots symbols on the centre payline in the base game or free spins. Any non-winning spin can also trigger the Second Chance – a behind-the-scenes random chance to win the prize. This slot will be particularly attractive for those who like the Multiway Xtra feature; it lands lots of wins in odd combinations and the nifty bonus feature adds yet more fun.